All our Preschool in Kindergarten Files at a savings! Crafts, Pocket Charts, Worksheets, Displays and more!!! SAVINGS! 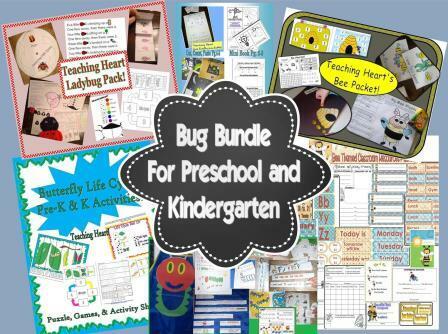 Look at all you get in this set: Bee Themed Learning Games, Math, Reading, and Craft Activities, Bee Themed Calendar and Classroom Forms, Bug, Insect, & Caterpillar - Math, Reading, Literacy, Activities, Centers, Apron, Caterpillar Butterfly Life Cycle Activities, Ladybug, Lady bug Life Cycle and Math and Reading Activities, + Bonus Firefly Set. OVER 100 Pages of Buggy Learning Fun!!! Tammy C. said: "Awesome packet! My kids loved it!" Page 5 - Printables to make a Bee Finger-puppet glove to go along with the five bees poem included. Page 6 - Simple Bee Glyph to Color and Take Home. Page 7- Bee 10 Frames. Page 8-9 - Bee counting puzzle. Give page 6 to the student already cut up. They glue the pieces to page 7 and color. Page 10 - Roll a Bee Scene. Print a few copies, Laminate, and cut out five bee pieces. Supply a dice and 1 playing board and set of pieces per player. First player to get all their pieces onto the blue backdrop wins. Page 11-15 - Counting Game Students work together to finish a puzzle. They collect Bees along the way. Game stops when puzzle is completed. Count the bees to find a winner. Directions included. Page 2022 - Two dice cover-up games. Page 23-24 - Dice Graph printables to make a graph. Student rolls until one column is filled. Page 26, 27, 28, 29 Craft idea Finger Bee Craft and Poem to Match. Beehive Printable to use with craft. Page 29 is just a ready to print version. All you do is add the fingerprints. Page 30 - Count By Fives Puzzle Print, laminate, cut. Students put the puzzle pieces together. Use as a center activity. Page 31 to 35 - Bee Pocket Chart Poem. I read the poem and call on someone to match the picture to the text. 15 Files of Bee Themed Resources to use in a Bee Themed Classroom. Start Back to School with a Bee Theme! These files are zipped. They come in Publisher or Word (if you own the programs you will be able to modify as needed). All files also come in PDF so that all can open them. Buyer said: "Very helpful forms. I bought it for the newsletter template but will be able to utilize the other forms." Buyer said: "Love that this has a variety of ideas, for math group and circle groups." 1.) Pocket Chart Pieces Print out the pieces, cut, and laminate. Use to re-tell the story as a class. Allow students to add the pictures of the moon, leaf, sun, and caterpillar to the chart as you read. Mix up the days of the week and put them back in order. caterpillar pieces wins. After the game, have students glue down the pieces to make a caterpillar to take home. 3.) Caterpillar Apron All pieces and directions needed to make the apron seen. Use to retell the story by feeding the caterpillar the items in the correct order. 4.) Caterpillar Paper Bag Puppet All pieces and directions needed to make the puppet seen. Use to retell the story by feeding the caterpillar the items in the correct order. Have each student make one by cutting out the pattern and gluing it to a paper bag. They can take their puppet and story pieces home to retell the story to a family member. 5.) Sleepy Caterpillar Story A mini book for your students to make. They color the pages based on the color word used on the page. Also, they add a number in the blank after counting the leaves on the page. Once finished the pages are cut and either hole punched or stapled to form a little book to take home and share. 6.) Beginning Sound Match Up All pieces needed to make a beginning sounds center. Each caterpillar has two pictures on its body. Students place the beginning sound next to the picture. 7.) Read and Number Layered Book -A book for your students to make. Students color the pictures and write the number words on the line. 8.) Pattern Cards Ready to print pattern cards. Laminate and use Velcro to attach the missing pieces. Store on a ring. rhymes with the picture on their butterfly card. 10.) Counting Review Student fills in missing numbers and counts the objects and writes the number. 11.) Butterfly Glyph Materials and directions to make Butterfly Glyphs. Includes patterns and legend. 12.) Ladybug Ending Sound - Letter mat with matching pictures. Student places picture on top of correct ending sound. 2 write the ending sound printables. 13.) Bug Graph Students cut and glue bugs onto a graph. Students answer questions about their finished graph. 14.) Caterpillar Trace- Trace the dotted line to take the caterpillar to a healthy snack. 15) Lady Bug Adding Student count dots to make a math addition problem . 16.) How Many Ladybugs Pocket Chart Students count the ladybugs on each leaf and match it to the correct number. 17.) Sort by Color, Count, TraceStudents cut out bugs, sort them by color, write how many in the circle, and trace the color word. To reuse with small groups, laminate and use a dry erase marker. Carrie Ann S. said: "Good stuff! My students and I found a tiger swallowtail caterpillar the first week of school. We decided to keep it in our bug tent and it started forming its chrysalis that evening. I instantly knew what our first science project would be! This packet was perfect! Thank you!" 1.) Butterfly Life Cycle Little Book - A six page color and take home and share little book. 2.) Pocket Chart PiecesFour large stages of a Butterfly Life Cycle - Eggs, Caterpillar, Chrysalis, and Butterfly. Includes large set of words to match to each stage. 3.) Life Cycle Chart student cute, and pastes the stages onto a chart. I have included this in color and black and white. 4.) Pre-Reading and Math - Trace the words: Eggs, Caterpillar, Chrysalis, and Butterfly. Trace Numbers, Cut-out, and Glue numbers. 5.) Activity Sheet - Cut and Glue the Next Stage of the Life Cycle. Graph the stages. 6.) Counting using numbers 5-12 Puzzle - Cut the puzzle and students put back together. 7.) Roll a Life Cycle Game - Students take turns rolling dice and collecting a piece of the life cycle based on their rolls. First person to roll and collect all four stages wins. Then they may sequence their stages in order. 8.) Race to Become a Beautiful Butterfly Life Dice Game - Supply 1 dice and a playing marker for each player. Player picks a color line and starts on the leaf. Players take turns rolling the dice. First person to make it to the Butterfly is the winner. (Pages 3-4) 5 Little Lady Bug Flap Book Student colors and traces numbers. The bugs disappear as the student read the poem and turns the pages. (Pages 5-8) Various 5 Little Lady Bug Poem Formats for use. (Pages 9 10) Counting Lady Bugs Pocket Chart Pieces or Center - Student counts ladybugs and matches it to a leaf. (Page 11) - Simple ladybug life cycle pocket chart pieces. (Pages 14-18) Lady Bug Life Cycle Cut and Past Wheel Craft - In color and black and white. Spin the wheel and share each stage of the life cycle. (Page 19) Ladybug Cycle Cut, Sort, Count, Trace, and Graph - Student activity sheet covering many early math skills. (Page 20) Ladybug Early Glyph Fun - Great way to introduce data interpretation with the younger students. Work through the glyph in small groups and let your students share their finished glyph with a parent. Easyall you need are crayons!! (Page 21) Ladybug counting puzzle - Print and laminate. Students can put the puzzle together. How many ladybugs do you see when you put the puzzle together. I like to print and bag a few of these to use in a center. (Page 22) Ladybug Phonics Activity Sheet - Student worksheet. (Page 23) Ladybug Roll and Draw Dice Game - Students take turns rolling the dice and drawing colored spots on a ladybug. First person to get all six colors drawn on the bug wins. (Page 24) Ladybug 10 Frames Student Worksheet - Students cut, count, and paste the numbers.